At Steven Brown, all of our products adhere to OSHA’s rigid guidelines, either meeting or exceeding every statistic. 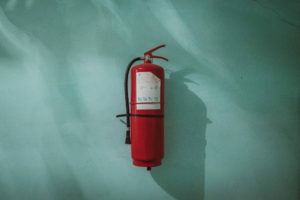 Today, we want to go through some of the most important facets of OSHA’s guidelines for fire safety in the workplace and help protect your workers and your business. One of the largest causes of fires and explosions in the workplace is due to improper chemical use and storage. When using flammable chemicals, reading warning labels and adhering to proper storage techniques is absolutely essential. Additionally, ensuring that all employees are practicing safe handling techniques and wearing the necessary protective equipment will prevent mishaps down the line. Bi-annual fire drills are a must for businesses, especially businesses that work with flammable materials. Clearly posting fire escape plans around the building will keep all employees informed and prepared in case of an emergency. Review your fire escape plan with your local fire department as well, to ensure that the plan is as efficient as possible. One of the largest issues in fire safety is ensuring a quick, safe escape for everyone in the building. Providing full accessibility to any fire equipment such as extinguishers and alarms will give your employees peace of mind should an emergency situation arise, and maintaining unlocked and readily accessible fire exits will contribute to employee safety as well. Electrical hazards are another of the leading causes of fires in the workplace. Unless you or your employees are qualified and authorized, faulty electric lines should be handled extremely cautiously by a professional. If something appears faulty or is causing suspicion, it should be immediately reported to the proper employee or outside company to remedy the problem, particularly if your building works with flammable chemicals that could become airborne. At Steven Brown & Associates, we’re proud to provide your company with the equipment it needs to stay safe and function smoothly in an emergency. Want to know more? Contact us today at 302-652-4722 or send us an email to request more information. We look forward to hearing from you! ← Fire Training with Steven Brown & Associates: Join Us!